Reading and share top 26 famous quotes and sayings about Aluminum by famous authors and people. Browse top 26 famous quotes and sayings about Aluminum by most favorite authors. 1. "And Man created the plastic bag and the tin and aluminum can and the cellophane wrapper and the paper plate, and this was good because Man could then take his automobile and buy all his food in one place and He could save that which was good to eat in the refrigerator and throw away that which had no further use. And soon the earth was covered with plastic bags and aluminum cans and paper plates and disposable bottles and there was nowhere to sit down or walk, and Man shook his head and cried: "Look at this Godawful mess." 2. "Near the docks downtown he swerves off the highway and races the cab toward the end of a deserted parking area and it hits me somewhere, now, this moment, when he drives into and then over a dilapidated, rust-covered aluminum fence, heading toward water, that all I have to do is put the Walkman on, blot out the sound of the cabdriver, but my hands are twisted into paralyzed fists that I can't unclench, held captive in the cab as it hurtles toward a destination only the cabdriver, who is obviously deranged, knows. The windows are rolled down partially and I can feel the cool morning air drying the mousse on my scalp. I feel naked, suddenly tiny. My mouth tastes metallic, then it gets worse. My vision: a winter road. 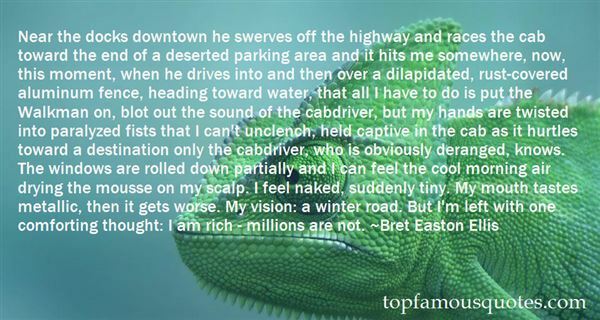 But I'm left with one comforting thought: I am rich - millions are not." 3. "I grew up on comic books. 'X-Men' was my favorite team; Wolverine was my guy. At 8 years old, I dressed up as Wolverine with Adamantium claws that I made out of aluminum!" 4. "My mother was a sociologist and an intellectual, and my father was an industrialist with a business in copper and aluminum wire. He was very strict and he wanted me to work in the family business - for him, the worst thing was having a daughter who worked in fashion." 5. "Despite my lifetime of declining rich desserts, my evenings spent jogging, regardless of all my careful moderation and self-discipline—I'm trapped, wadded inside a shell of steel and aluminum. My body, violated in countless places by fragments of broken glass. My low-cholesterol blood rushes to abandon me in hot, leaping spurts. Despite all my care, the heart-attack victim and I will both be just as dead." 6. "Stuart and Jenna exchanged rings-platinum band for Stuart, and platinum with diamonds for Jenna, but they could have been aluminum or plastic. Expensive rings did not guarantee a happy life together." 7. "All teachers who were telling everyone where to go were wearing outfits made of aluminum foil , like robot aliens ." 8. 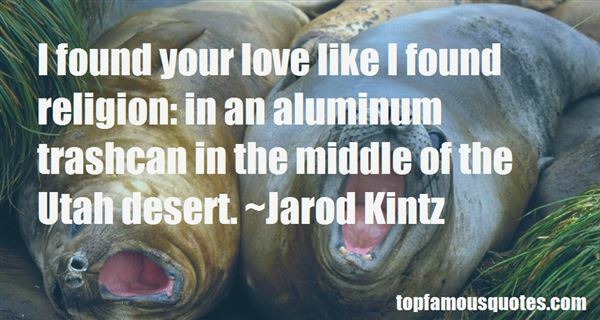 "I found your love like I found religion: in an aluminum trashcan in the middle of the Utah desert." 9. "Far as I knew, closest she'd gotten to art was a drafting table and dressing mannequins in store windows, and the closest I'd gotten to saving the world was my name on some petitions, for everything from recycling aluminum cans to saving the whales. I put my cans in the trash now, and I didn't know how the whales we're doing." 10. "My breath is halted, like grasping for air after crying far too long and hard. It is like a hiccup, with a shivering sharpness of nerves. It is like icicles running down your spine or aluminum in your mouth, an eerie amount of emotions that cannot compare to the actual feelings you've managed to live through. I just watched you die, I say to myself silently." 11. "She stared at the faded tile floor before her feet, but knew his every step around her small kitchen. When Martin touched the coffee cup patterned curtains he must assume she'd made, her fingers throbbed. When his eyes slid across the flowery aluminum water bottle at the table, her throat cracked with thirst.The radio clicked off.The silence of the room soaked up her raspy breaths, her pounding heart, her ache, and stirred them around the one man she ever longed for in a way that changes how you taste the world.Her desire swirled in a pulsing, betraying, blurry hook, and encouraged him to move closer.Martin obeyed." 12. "Although this table contains a great many elements, from the element oxygen, which is found in the air, to the element aluminum, which is found in cans of soda, the table if elements does not contain one of the most powerful elements that make up our world, and that is the element if surprise." 13. "This kiss is zeroes and ones jumbledand tossed into a pneumatic system,unscrambled at the end and scrawledonto a tape recorder slowly rollingat the side of your bed,then slapping back, reverbedoff the ringer, a tinny phantomof the smooch like a smack onan aluminum can, up the same veins through the belly of the same satelliteand softly to the side of my head;"
14. 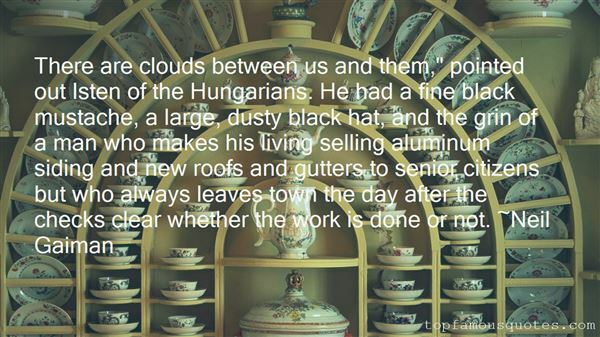 "There are clouds between us and them," pointed out Isten of the Hungarians. He had a fine black mustache, a large, dusty black hat, and the grin of a man who makes his living selling aluminum siding and new roofs and gutters to senior citizens but who always leaves town the day after the checks clear whether the work is done or not." 15. "Honey, have you seen my measuring tape? ""I think it's in that drawer in the kitchen with the scissors, matches, bobby pins, Scotch tape, nail clippers, barbecue tongs, garlic press, extra buttons, old birthday cards, soy sauce packets thick rubber bands, stack of Christmas napkins, stained take-out menus, old cell-phone chargers, instruction booklet for the VCR, some assorted nickels, an incomplete deck of cards, extra chain links for a watch, a half-finished pack of cough drops, a Scrabble piece I found while vacuuming, dead batteries we aren't fully sure are dead yet, a couple screws in a tiny plastic bag left over from the bookshelf, that lock with the forgotten combination, a square of carefully folded aluminum foil, and expired pack of gum, a key to our old house, a toaster warranty card, phone numbers for unknown people, used birthday candles, novelty bottle openers, a barbecue lighter, and that one tiny little spoon. ""Thanks, honey."AWESOME!" 16. "I don't have aluminum foil on my windows anymore." 17. "Meat!" he said scornfully. "I'm a vegetarian. "You eat cheese enchiladas and aluminum cans," I reminded him.Those are vegetables." 18. "America isn't young, you know. It's ancient and evil. With aluminum siding." 19. "One picks one's way about through the glass and aluminum doors, the receptionists' smiles, the lunches with too much alcohol, the openings with more, the mobs of people desperately trying to define good taste in such loud voices one can hardly hear oneself giggle, while the shebang is lit by flashes and flares through the paint-stained window, glimmers under the police-locked door, or, if one is taking a rare walk outside that day, by a light suffusing the whole sky, complex as the northern aurora." 20. "You're from where?""Lay'en. It's near Salt Lake City. ""Spell that for me. ""Um, that would be S-A-L-T-""No, the other one. The city you're from.""Oh. L-A-Y-T-O-N.""Ah-Lay-ton. "That's what I said. ""No you didn't. You just said, 'Lay'en. '""So I did. But just go ahead and pronounce 'aluminum' for me, Mr. British Man. How are you going to defend that piece of insanity? Why don't you spell it and count syllables and see if your al-um-in-ium makes sense whatsoever? "He bowed his head. "Touché..."
21. "It is midnight in the hard part of town. The mask is itching like it always does. The ragged end of my cape is soaking in a puddle of something I don't want to guess about. I'm crouched behind a kicked-in aluminum trash can. It stinks of rotted meat and drunkard's piss - and I feel right at home. (from Nothing to Lose)"
22. "Smiling, he handed Landry the bloody aluminum bat Warnick had used. ‘Time to die, old man,' he said." 23. "I knew chemistry would be worse, because I'd seen a big card of the ninety-odd elements hung up in the chemistry lab, and all the perfectly good words like gold and silver and cobalt and aluminum were shortened to ugly abbreviations with different decimal numbers after them." 24. "Dexter thrust a pamphlet into Samuel's hand. "Greenstreet Mission. We're doing a Christmas dinner. You can get a meal and hear the word of God. "Samuel smiled in relief. This, finally, he understood. "Which word?""What? ""Well, God's said a lot of words, you know, and a word like 'it' or 'the' wouldn't be worth hearing again but its always fun listening to Him try and say aluminum." 25. "The Boy with Nails in His Eyesput up his aluminum tree.It looked pretty strangebecause he couldn't really see." 26. "Mr. Smith yelled at the doctor,What have you done to my boy?He's not flesh and blood,he's aluminum alloy! "The doctor said gently,What I'm going to saywill sound pretty wild.But you're not the father of this strange looking child.You see, there still is some questionabout the child's gender,but we think that its fatheris a microwave blender." Two children of same cruel parent look at one another and see in each other the image of the cruel parent or the image of their past oppressor. This is very much the case between Jew and Arab: It's a conflict between two victims."